One of Southern Africa's most exclusive safari destinations, Botswana is a true wildlife haven. Its landscapes are as diverse as they are beautiful, ranging from the lush wetlands of the Okavango Delta to the arid drama of the Kalahari Desert. Botswana is also one of Africa's most stable countries, with a conscientious government and a relatively high standard of living. Botswana is a land-locked country in central Southern Africa. It shares land borders with Namibia, Zambia, Zimbabwe and South Africa. Geographically, it is mostly flat (although there are a few hilly regions). Notable features include the Okavango Delta in the northwest; the Mkgadikgadi Pans in the northern center; and the Kalahari Desert in the central and southwest. The total area of Botswana is 224,607 square miles/ 581,730 square kilometers, making the country slightly smaller in size than Texas. Botswana's capital city is Gaborone, located in the southeast near the South African border. The CIA World Factbook estimated Botswana's population to be just over 2.2 million in July 2016. The Tswana or Setswana people comprise the country's largest ethnic group, accounting for 79% of the population. The official language of Botswana is English, but it is spoken as a mother tongue by just 2.8% of the population. 77% of Botswanans speak Setswana, the most prevalent native language. Christianity is practiced by almost 80% of Botswanans. A minority still follow traditional beliefs like Badimo, the worship of ancestors. The official currency is the Botswana pula. Use this online converter for accurate exchange rates. Botswana has a semi-arid climate with hot days and cool nights throughout the year. The dry season usually lasts from May to October. It coincides with the southern hemisphere winter, and as such nights and early mornings can be chilly. The rainy season lasts from December to March and is also the hottest time of year. The best time to visit Botswana is generally during the dry season when temperatures are at their most pleasant, mosquitoes are at a minimum and wildlife is easier to view due to a lack of summer foliage. However, the wet season is especially rewarding for birders and for trips to a greener Kalahari Desert. 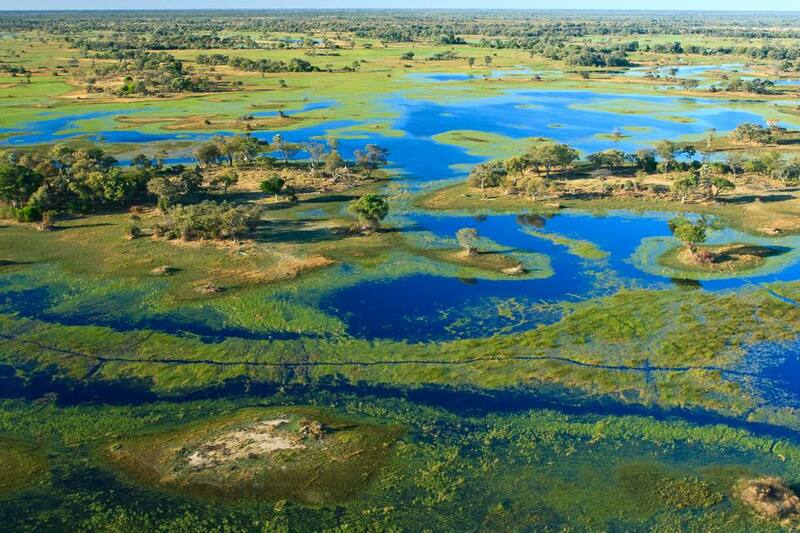 In the country's northwest corner lies the Okavango, a vast river delta surrounded by the Kalahari Desert. Every year, the Delta floods, creating a swampy wetland that teems with exotic animals and birds. It is possible to explore on foot or via traditional canoe (known locally as a mokoro). The Okavango Delta is a UNESCO World Heritage Site and Moremi Game Reserve (located just to the west) is one of the best places in Africa for spotting leopards. To the east of the Delta lies Chobe National Park. It is famous for its huge elephant population, and for the Savuti Marsh, which has one of the highest year-round animal concentrations in Africa. During the dry season, animals come from far and wide to drink at the Chobe River, making a water safari especially rewarding at this time of year. The birdlife here is legendary, with many regional specials including African skimmers and Pel's fishing owls. Centered around a fossil lake bed to the south of Chobe National Park, Nxai Pan National Park offers an entirely different landscape of sloping sand dunes and towering baobab trees. It floods in the summer and provides an excellent low season option for game-viewing and birdwatching. In winter, the dry park resembles the surface of the moon, with cracked salt pans stretching as far as the eye can see. The park shares a border with Mkgadikgadi Pans National Park. In the extreme northwest of the country, the Tsodilo Hills act as an open-air museum for San bushman culture. Amongst the rock outcrops and hills are hidden some 4,000 paintings. They give an insight into the lives of the ancient San, who are believed to be the direct descendants of the very first Homo sapiens or human beings. The hills were a place of great spiritual importance for local tribes and many of the paintings depict the sacred eland antelope. The main gateway for overseas visitors is the Sir Seretse Khama International Airport (GBE), located just outside Gaborone. It is also possible to travel overland to Botswana from neighboring countries like Namibia and South Africa. Citizens of most first world countries do not need a visa to enter Botswana for a short vacation – for a full list of visa rules and requirements, check the official government website. Before traveling to Botswana, you should ensure that your routine vaccines are up-to-date. Hepatitis A and typhoid vaccinations are also recommended, while anti-malaria prophylactics may be necessary depending on where and when you plan to travel. The CDC has further information about recommended healthcare precautions.